Doorly's 12 Year Old Rum Review the! Offerings from Foursquare Distillery this year have been a little like buses. You wait ages then two come along at once! We’ve really been lucky in the UK this summer. Seeing a limited edition Foursquare Port Cask Finish and at long last, this mythical beast Doorly’s 12 Year Old. I heard rumours of a 12 Year Old Doorly’s rum which was available to visitors of Foursquare Distillery and in very select outlets on the island of Barbados. A review I came across by Robert Burr here, further piqued my interest. I also found another article in which the intrepid adventurer came across a bottle here. So it definitely existed! Doorly’s 12 comes in the classic stubby Doorly’s bottle. Used by the other rums in the range. I was expecting a corked enclosure for a 12 year old rum. I was slightly disappointed to find a screw cap. Unlike the other Doorly’s bottlings you get a very nice protective cardboard sleeve which is very sturdy (unlike many). The front label has the familiar Doorly’s. The Macaw on the front of this bottling is actually the Spinx Macaw which is widely accepted (although not officially confirmed as yet) to be extinct in the wild. The bird also features quite prominently on the cardboard sleeve. Foursquare Distillery Seale-d the rights to the Doorly’s range in 1993. I have a feeling that this particular rum is all Foursquare’s doing. I don’t think it was available prior to them taking over the brand. 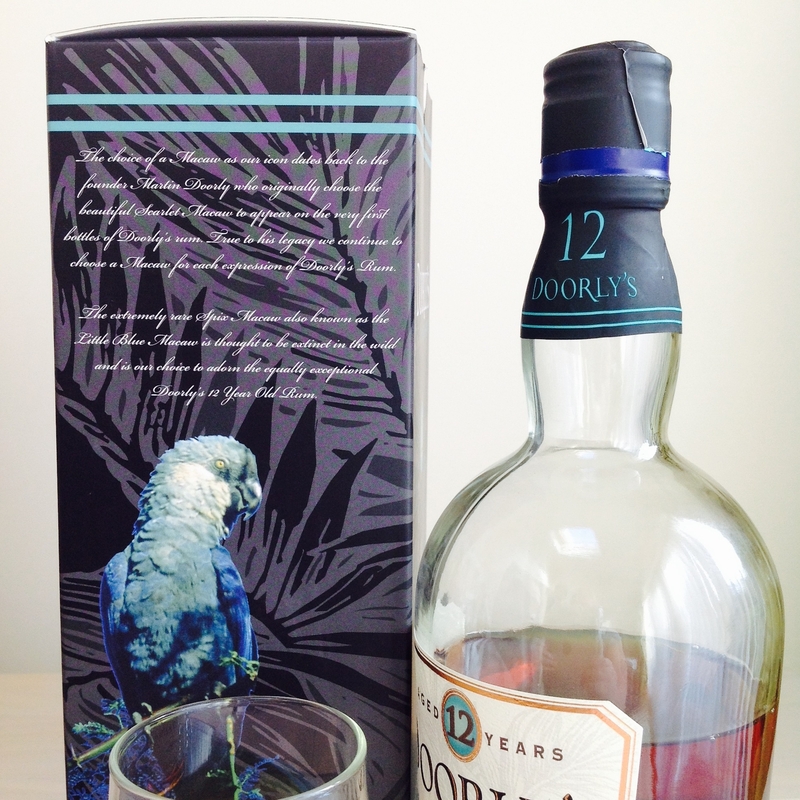 Doorly’s 12 Year Old is actually the third 12 Year Old rum I have bought from Foursquare Distillery. The others being “The Real McCoy” 12 Year Old and Rum Sixty Six. Due to Richard Seale’s innovative and clever use of various finishing and blending techniques (he uses Port, Madeira and other wine finishes as well as Bourbon Casks) he is able to produce many distinctive products. Proving that unlike some suggest, Bajan rum is far from being boring and samey. Doorly’s 12 Year Old will set you back around £35 in the UK for a 70cl, bottled at 40% ABV. The rum is a blend of pot and column still rums, the pot still brings complexity, depth and weight to the blend, whilst the column still brings a good balance of aroma and flavour. Doorly’s 12 Year Old Rum is a blend of rums, 90% aged for 12 years in Kentucky Bourbon and 10% aged for 12 years in Madeira cask. The rums are blended and allowed to marry together for a short period so the rums fully integrate. The rum presents itself in the glass as a lovely coppery/red colour. Its nose is classically Bajan (or classically rum if you like!). It is slightly heavier than the younger Doorly’s rums with more chocolate and toffee notes, a lot more oak in the mix. This could be extra Pot Still rum, extra ageing or both. There are also notes of fortified wine giving the nose an extra fruity blast of banana and and rich dried fruits. Familiar notes of vanilla and light toffee/caramel are also present. Any alcohol fumes found in younger or less crafted rums are non existent. A very inviting and well balanced nose. Tasting the rum reveals more of the oak. An initial hit of sweetness, brown sugar and a little spicy pepper is overtaken by dry oaked flavour and a nice spiced heat. The finish is very smooth and long lasting. The oak and slight smokiness of the rum remains but you also get notes of vanilla. A little nutmeg and cinnamon remain in the palate. What I like about Doorly’s 12 is that it is noticeably different to Rum Sixty Six. It is slightly drier, more oaked and not as sweet as that rum or the Port Cask Finish. It also should be noted the price of these rums. In a world where “Super Duper Premium Rums” by “here today gone tomorrow” distilleries or alcohol plants are selling rums for well in excess of £50 and often upto the £150 mark and beyond – Foursquare continue to turn out world class rums priced at between £18 and £35! If you are fan of Bajan style rum, then for me any offering from the Foursquare Distillery is well worth investing in. They simply do not make bad rum. As you can see from the tasting notes this rum offers all the complexity a good aged rum should offer to the sipper. As usual it is expertly blended and it shows yet again that rum can be produced, which is “smooth” and doesn’t exhibit any notably strong alcohol notes, without loading it with sugar and other additives. Do you know what the significance of the Spix Macaw is on the bottle? Do they explain it at all?